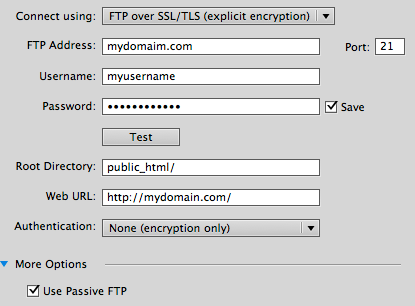 Your server supports secure data transfer via the "FTP over SSL/TLS" protocol. Adobe Dreamweaver versions prior to CS5.5 do not allow for secure FTP over SST/TLS. For this reason Dreamweaver users accustomed to simply clicking the "Put" publishing button to upload files or changes will need to use alternate FTP software to do so, or upgrade to Adobe Dreamweaver CS5.5 or higher. appear. Click the Accept or Trust Certificate button and this message will go away nicely.